With so many products to test, the Layered Online office can look more like a salon itself! But with so much to choose from, how many products make it into our daily rotation? We did a quick tally around the office to see just how many hair products each of us use on the daily. The result? Not as many as you might think. How many do you rack up? I have chronically oily roots, so I usually mix two shampoos to get the desired effect for my hair. Generally I reach for something to gently cleanse – at the moment I’m loving the L’Oréal Professionnel Source Essentielle Daily Shampoo – with an added blob of either a more clarifying or volume-boosting shampoo, depending on the state of my hair. I have quite fine, straight hair so it’s more for detangling purposes than hydration that I use conditioners. A couple of times a week I’ll use a proper wash-out conditioner, but most days I’ll use a multi-purpose heat protector/detangler which gives enough moisture for me. I love Coco Loco Blow and Go Genius Lotion from Lee Stafford – it does a bit of everything and has the perfect coconut scent without being overwhelming. I like to let my hair about 70 per cent heatless, so I’ll usually wrap it in my Aquis Hair Towel. It’s the perfect size and weight, and I can just clip this up and potter around until I’m happy. I’m completely obsessed with the R+Co Dallas Thickening Spray. I’ve never really used anything quite like it – other blow dry sprays I’ve tried are either super sticky or they don’t seem to do anything at all. This one is perfect, and I notice such a difference if I forget to use it. It just gives the most gorgeous bounce and lift to my usually flat roots, yet it feels totally weightless when I spray it on. Magic? Witchcraft? I don’t care, as long as they don’t discontinue it. I’m very picky about texture sprays - I hate products that leave my hair feeling too sticky or matted because I subconsciously touch my hair a lot (which really helps with that oily hair, let me tell you). I know friends who will be buried with Oribe’s Dry Texturizing Spray, but I actually prefer the Charles Worthington Volume & Bounce Texturising Spray. I tip my head over, mist lightly through the ends and under the crown, then flip back over and brush through loosely with my fingers so I don’t lose too much of the volume. I mix shampoos up quite frequently, and I generally try to go for sulphate-free ones. But if I can get my hands on Living Proof then I will use that over anything else. Either the Full Shampoo or the No Frizz Shampoo - it makes my hair silky smooth and smells divine. It’s honestly my favourite brand – and I tell myself that Jennifer Anniston uses it too, obviously! I also love the Living Proof Leave In No Frizz Conditioner, it really helps my unruly waves! I never comb through my hair when it’s dry, only in the shower using the Wet Detangler from Tangle Teezer. I always towel dry my hair. If it's looking a little dry then I'll use some hair oil or serum for my ends sometimes. I mainly use it when I colour my ends pink and they can feel a bit dry, so I use the Schwarzkopf Bonacure Colour Freeze Gloss Serum which is great for nourishing and helping to prevent the colour from fading too. If I don't have time to blow dry my hair properly I'll just scrunch up my curls with styling spray or salt spray and let it air dry. The Davines Sea Salt Spray is great for natural-looking waves. If my fringe is misbehaving I'll use some of the Davines Curl Building Serum to calm it down. It has a really lovely texture and makes my fringe feel a bit heavier so I can curl up the ends – plus it’s anti-frizz! If I'm blowdrying my hair straight then I'll use some blow dry spray. I really like a couple of sprays mix them up - Percy and Reed The Perfect Blowdry spray is great when I'm straightening my whole hair, but I feel it’s a bit strong for when I'm only doing my fringe. In that case I'll use Kenra Professional Platinum Blow Dry Spray. On days where I have zero time and don’t wash my hair, I usually just spray a little Lazy Girl Dry Shampoo by Sam McKnight and wear either my fringe up in a quiff with a couple of bobby pins, or throw it all in a ponytail/bun and go. As a not-so-natural blonde with thick hair and oily roots, I’ll regularly switch up my product routine to best suit the condition of my hair. Without fail, I’ll use two shampoos to wash my hair – the first (usually) being a purple shampoo to kick any brassy tones to the curb. At the moment, I’m working my way through a one litre mega bottle of Osmo Super Silver No Yellow Shampoo. For my second wash, I’ll use an ‘all-rounder’ shampoo to give a deep clean without being too stripping. I’ll always use a detangling or heat protection spray before blow-drying. I’m a sucker for the Lee Stafford Coco Loco Heat Protection Mist because it smells SO good, as well as being a multi-purpose product which does the job. Sometimes I’ll use the PRO:VOKE Touch Of Silver Leave-In Conditioner for a quick spritz through the ends before drying, as it’s a match made in heaven for blonde hair. After a quick blast with my hairdryer, recently I’ve been running the Aveda Smooth Infusion Style-Prep Smoother through the mid lengths to ends, as lately I’ve notice how unruly my hair has become with the constantly changing weather conditions. It’s great for taming frizz and helping to keep my hair smooth and sleek. On days when my hair feels particularly dry and damaged, I’ll run some L’Oréal Professionnel Série Expert Nutrifier DD Balm through the ends to add a little extra nourishment and reduce those pesky tangles. It’s a hero product for anyone with hair in need of some TLC. 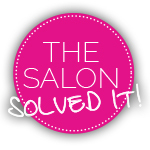 When it comes to finishing products, I’ll very rarely use a hair spray or other styling options. 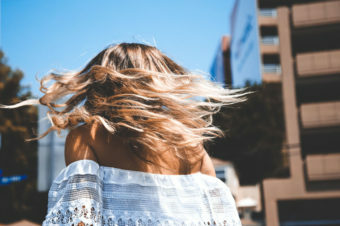 It goes without saying I have a dry shampoo in my arsenal though, and for days when I need some heavy-duty work and a little extra volume, the Living Perfect Hair Day Dry Shampoo works wonders. If I’m feeling particularly fancy, before walking out the door I’ll also give my hair a quick spritz of the Goldwell Kerasilk Color Beautifying Hair Perfume to give my locks a touch of shine. I’m not, by any stretch of the imagination, one of these mysterious morning people. So the first thing I do post-alarm, having scrambled around to find my glasses and peeled myself out of bed, is stand under a cold stream of water and wash my hair with System Professional Man Energy Shampoo. I started using it when I was on the press trip celebrating its launch because I don’t trust hotel shampoo – and I haven’t looked back since, even though it’s technically “For Men.” It has a crisp, clean smell that really wakes me up, as opposed to some of the more soothing scents that could lull me back to sleep, and it gives my natural roots a really good deep clean. Because I have bleach on the ends of my hair, I slather on the Rusk Hydrate Conditioner, which makes it lovely and soft. Before blow-drying, I spray on Revlon Professional Eksperience Hydro Nutritive Keratin Restructuring Spray, which I think of as a shield for my hair from all the horrible things I put it through. I also find it a very satisfying product to use – the two liquid components separate overnight, so you have to tip it upside down to mix them again, which I imagine activates whatever magic is inside. To keep my split, blonde ends from frizzing up at the faintest hint of moisture, I apply some of evo’s Head Mistress Cuticle Sealer, laugh for the 100th time at the weird story on the product tube, and go out to face the day. Since this magical stuff launched earlier this year I've refused to be parted from it. Part of the new Resistance line, the Kérastase Bain Extensioniste shampoo and conditioner duo is chock-full of amino acids to help build stronger hair fibers, ceramides to smooth, and cleansers which manage to somehow be both gentle and effective. Stronger, longer, smoother hair? Never leave me! Sometimes I'll reach for the L’Oréal Professionnel Serie Expert silver shampoo whenever the blonde starts looking a bit warm, pulling it back to the icy hue I intended. Paying for my bleach blonde habit, every third wash I will use the L'Oréal Expert Professionnel Smartbond Conditioner to strengthen, repair and leave my hair in noticeably better nick. 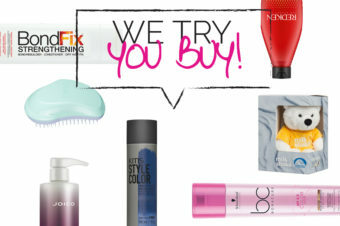 You might be noticing a trend here, but it's time for more products to soften and add shine. Before drying I'll liberally spritz Pureology Colour Fanatic Multi Tasking Hair Beautifier Spray throughout - it's an all-in-one frizz fighter with a dose of colour protection - and add a drop of System Professional Luxe Oil Elixir on wet hair. I often add a touch of the Balmain Paris Hair Couture Shine Wax on my dry ends to help take down the fuzz. Sometimes you simply can't fight the fuzziness any longer. On those days I reach for either Cool Girl by Sam McKnight or Oribe Dry Texturizing Spray and blast them liberally through the ends.